An ‘all in one’ treatment for facial & leg veins and now for Haemorrhoids too! Since 1998, Doctors in Europe have been working with medical device manufacturers to develop the perfect treatment for veins and other vascular conditions such as Haemorrhoids. By 2001, clinical trials confirmed the success of a technique known as thermo-coagulation which utilised a focused radio frequency heat energy to break down the vessel wall through the skin causing its immediate disappearance. It was safe, reliable and relatively painless – a walk-in, walk-out procedure with no pre-care or aftercare required. Its application was limited however to the very fine superficial veins of up to 0.3mm thereby necessitating the complementary use of alternative treatments such as sclerotherapy to eradicate the larger reticular vessels. 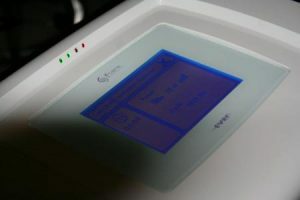 FCare Systems NV, based in Belgium, have since developed the utilisation of that same radio frequency technology, in the treatment of larger veins, hoping to eradicate the need to combine sclerotherapy and to extend the treatment range further to include not only reticular veins but also the short and long Saphenous, creating a complete vein solution. They set out to devise proprietary catheters through which they can apply their RF energy and to incorporate those within a new device which could offer the entire range of treatments across the vein spectrum from one ‘box’. This has resulted in the EVRF™. For the fine superficial veins on the face and legs, the EVRF uses an ultra-fine (generally) insulated needle that allows for their safe and precise closure with minimal trauma to the skin or surrounding tissue. In addition, it offers a range of proprietary hand-held catheters, using the equivalent technology, to treat reticular vessels thereby replacing the need for sclerotherapy, and a newly developed endovenous catheter to treat the long and short Saphenous veins, referred to as the CR45i. NEW! The latest development from FCare Systems is a new treatment called The Rafaelo Procedure, which stands for Radio Frequency treatment of Haemorrhoids under Local Anaesthetic. It utilises the same RF technology as EVRF but purely for the treatment of Haemorrhoids. Its proprietary probe can treat all grades of internal Haemorrhoids, safely and reliably, in most cases avoiding the need for invasive surgery and allows the patient to return to their normal daily activities immediately after treatment. For more details on The Rafaelo Procedure, please visit www.rafaelo.co.uk by clicking the Visit Rafaelo tab in the top menu or register your interest in the treatment, as practitioner or prospective patient, via the link in the column on the right of this page. There is no ‘one cap that fits all’, even the EVRF has its limitations, but it provides another tool in the surgeons toolbox to enable options for whichever scenario may arise. What adds to its attraction is that it can sit along side existing treatment methods, and in most cases without any capital investment*. Treats reticular veins – no more sclerotherapy! Treats the long and short Saphenous veins – with great functional advantages and considerably cheaper than alternative methods! Whatever your clinic or hospital currently use to treat spider veins, reticular veins or indeed the greater saphenous, there is no other medical device which gives you the same flexibility and functionality to enable the treatment of all three*. For more information, visit the EVRF page.